Several friends were watching the falconcam yesterday, March 9, as Hope laid her second egg at 11:21am. I heard the news immediately even though I couldn’t touch my cellphone (I was driving). Experienced egg watchers knew she was laying an egg because she stood above the scrape for a while with her tail down, then raised it as shown above. This posture is subtle in the still photo but obvious on streaming video. 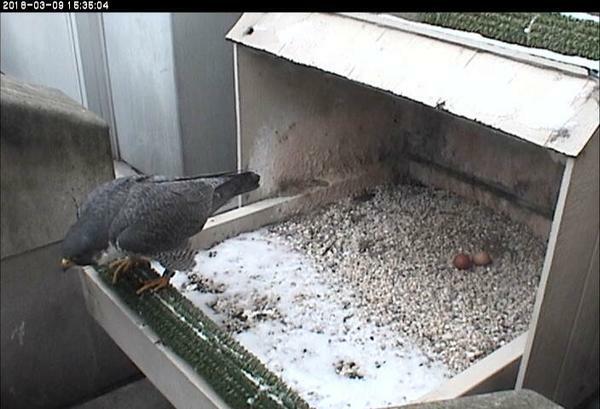 It was cold yesterday — only 31 degrees F — so the peregrines stayed on the eggs to keep them from freezing. … Terzo arrived to shelter the eggs. Though Hope and Terzo have been “on the eggs” they won’t begin true incubation until she’s laid her next-to-last egg. 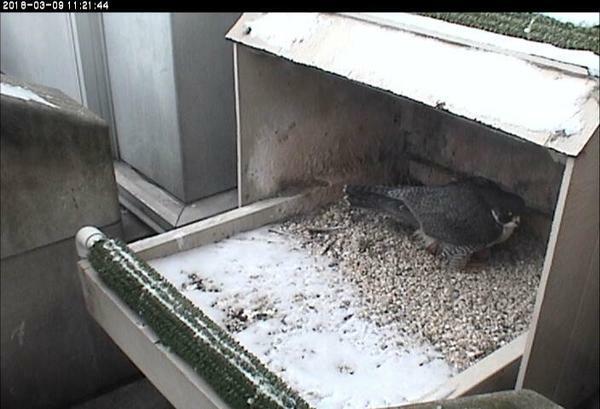 Click here to read about the peregrines’ incubation strategy. Hope typically lays four eggs, each two and a half days apart, so you’ll get two more chances to watch for that tail action. 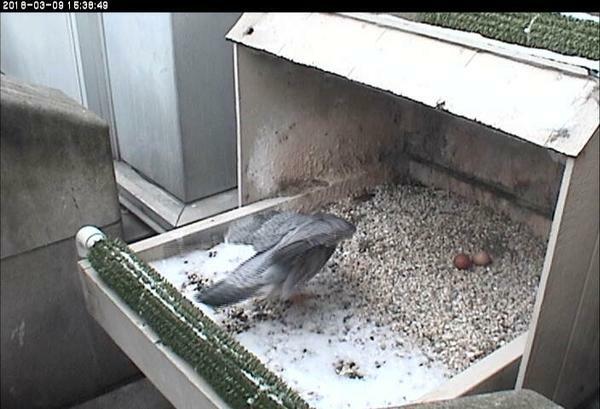 However, her next egg will probably be laid in the middle of the night. I saw Hope lay a third egg at 210 am Monday March 12. Please fix that camera a peace of junk I get all of them except this one hope & the gulf building please!!!! Elaine, here are tips and instructions for viewing the cameras. Your problems puzzle me because you’re the only one that I know of who cannot see the cameras at all.